With warmer weather on its way, sports and exercise is likely on your mind. Exercise and sports injuries are sometimes serious and require specialized treatment. At the Spine Institute of Arizona, we utilize a multi-disciplinary approach to help our patients regain their mobility, comfort and function. Read below for an informative article on sports injury prevention. Injury prevention is one of the most most important parts of training for a team sports athlete. Every sport has its share of accompanying injuries, but as the saying goes, “You can’t help your team if you’re in street clothes.” This is why it’s important to train, not only to build strength, but reduce the risk of injury. Not every injury can be prevented. But training programs structured to prevent injury, often called pre-habilitation (pre-hab), make it easer (and less painful) to prevent an injury from occurring in the first place. 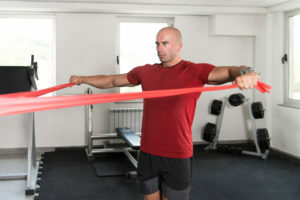 Internal External Rotation: With bands looped under the feet, and upper arm parallel to the ground, rotate hands down so they are level with the elbow — and then back up with constant tension. Perform three sets of 12-15 reps two to three times per week. Light dumbbells can be used. Cuban Press: As above, hold bands at your side, pinch shoulders back and then pull weight up, with constant tension, so that upper arm is parallel to ground. Perform three sets of 12-15 reps three times per week. Light dumbbells can be used. Set hurdles at hip height and perform three to five sets of two of the exercises below per day — with three to five hurdles constituting a full set. 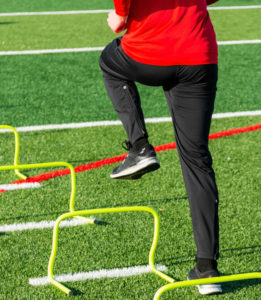 Side movement, lead leg over: Stand right of hurdles. Raise lead leg over, maintaining a slight bend in the leg. Proceed to the next hurdle with a slight skip; be sure to stay on the balls of your feet as you plant each leg. Side movement, cross-over leg over: Stand left of hurdles. Raise your crossover leg over, maintaining a slight bend in the leg. Proceed to the next hurdle with a slight skip, and stay on the balls of your feet as you plant each leg. Side movement, lead leg, then opposite: Stand right of hurdles. Raise lead leg over (again, maintaining a slight bend) and then off to the side. Proceed to the next hurdle with a slight skip; stay on the balls of your feet. Front movement, from side: Stand facing hurdles. Proceed with one leg at a time by raising each knee over the first hurdle. Proceed to the next hurdle with a slight skip; stay on the balls of your feet as you plant each leg. Front movement, down center: Stand facing hurdles. Raise lead leg over the first hurdle — bring trail leg over the second hurdle. (The hurdles must be set close enough to accommodate this.) Stay on the balls of your feet. Duck under, stay low throughout: Stand perpendicular to hurdles. Duck under first hurdle with lead leg. Make sure movement is initiated by pushing buttocks back and that your feet face forward. Stay in a low squat position throughout this drill. Duck under, pop up: Stand perpendicular to hurdles. Duck under the first hurdle with your lead leg. Make sure movement is initiated by pushing buttocks back and that your feet face forward. Pop up from the squatting position after you clear each hurdle. Duck under, twist, stay low: Stand perpendicular to the hurdles. Duck under the first hurdle with your lead leg, and then twist to lead under the second hurdle with your opposite leg. Make sure your movement is initiated by pushing your buttocks back and that your feet face forward. Stay in a low squat position throughout the drill. Duck under, twist, pop up: Stand perpendicular to hurdles. Duck under first hurdle with lead leg, and then twist to lead under second hurdle with opposite leg. Make sure your movement is initiated by pushing your buttocks back and that your feet always face forward. Pop up from the squatting position after you clear each hurdle. Forward zig-zag duck under: Stand facing hurdles arranged in a zig-zag pattern. (Zig-zag: Each successive hurdle offset one length from the previous hurdle.) Duck under each hurdle, and pop up between them. Not only will this workout bullet-proof your body, but it will make you a better athlete as well. Original article published on active.com.